Normally, I would provide the blurb that clues in the details of the book’s plot and talk about all the amazing aspects that are clued in from said blurb. But, time for a confession: I have actually only read the first book in The Shattered Kingdoms series, Blood’s Price. I haven’t actually read Fortune’s Blight yet. I even own it, ironically enough. 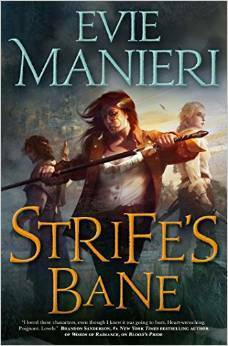 So I’m avoiding providing a blurb here, let alone reading it, for Strife’s Bane, third book in the series, because, you know, spoilers. I will say this: I absolutely loved the first book. It’s stuck with me since I read it, which feels like ages ago (which, in reality, it was). Manieri quickly climbed as one of my favorite authors of all time, even after only reading one book. Hell, I loved it so much that when Fortune’s Blight came out, I splurged and immediately bought it. Of course, life got in the way and I haven’t read it yet, but every time I see it on my bookshelf, I’m always wondering why I haven’t continued a series that captivated me so utterly and left my speechless after finishing book one. So it may be weird for me, this week, to choose a book to be stoked about when I haven’t even finished the other books ahead of it. But now that I’ve realized this book comes out this year, I have a little extra incentive to not only read Fortune’s Blight, but reread Blood’s Price, as well. Because who doesn’t want to reread an awesome story every once in a while?